Party season is fast approaching and now is the time to start thinking about planning festivities before the seasonal rush starts. Whether you’re planning a party in your office boardroom or want to bring the team for a private party, the team at Hawksworth Catering can help take the stress out of the season. 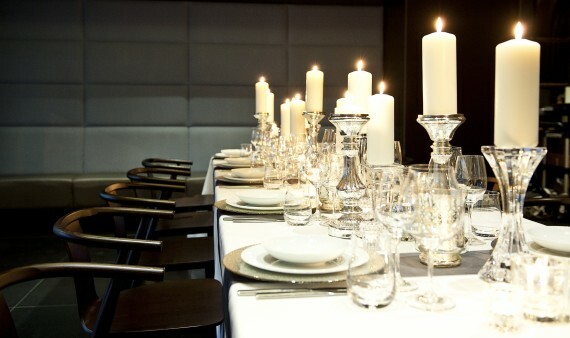 Opt for customized canapes and cocktails for an on-site event or book a private room such as Hawksworth Restaurant’s historic York Room in the Rosewood Hotel Georgia for an elegant taste of the 1920s or hire Bel Café after hours for a special space. Take the team to Vancouver’s hottest casual contemporary restaurant, Nightingale, for shared plates and creative cocktails around the semi-private Chef’s Table, which seats 16 people and is perfect for intimate holiday celebrations. Get in touch with our team at events@hawksworthrestaurant.com or 604.605.3325 ext1 to find out more about ways to make your holiday party sparkle this season. 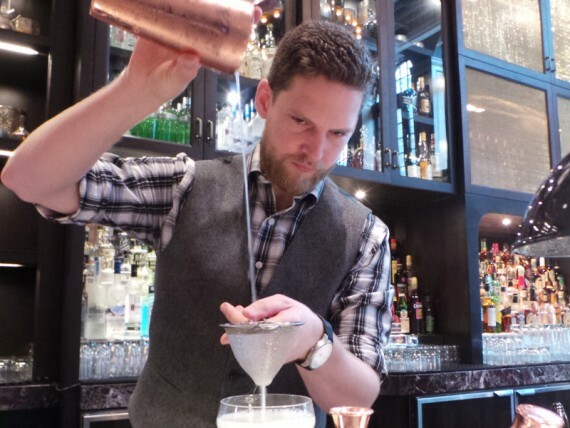 Meet Rhett Williams, the day lead at the Nightingale bar. With a diverse background in music, film and chemistry; Williams’ creativity naturally led him into the art of mixology at a young age. As a talented writer, Williams wrote about his passion which included spirits, cocktails and their history for several websites before ending up showcasing his flair behind the bar. His journey includes managing the bar program at Pourhouse and setting drinks on fire at the Shameful Tiki Room. Meet Alex Black, the evening lead of the Nightingale bar. 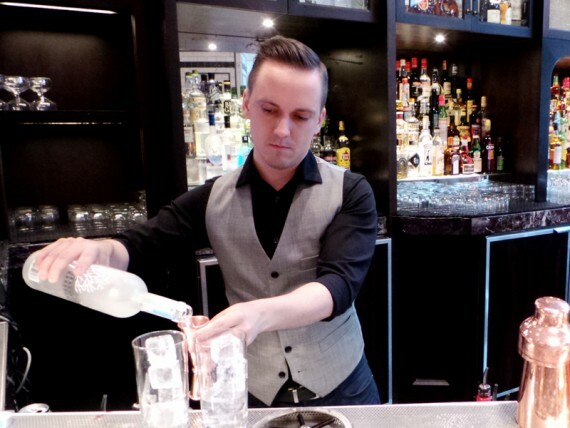 Having honed his skills in hospitality and bartending for over 15 years, Black has worked under well-known umbrellas such as the Donnelly and Glowbal group. Dedicated to his craft, Black has also participated in many Pacific Northwest’s most prized bar programs and events as well as acquiring an impressive list of certifications and personal awards. Don’t let all this talent go to waste, visit us for a cocktail at Nightingale! Each of competitors were given identical ingredients and allowed two hours in the kitchen to inspire the taste buds of the judges. Some of this year’s ingredients included whole rabbit, double-smoked bacon, fresh herbs and a wide selection of fresh produce and dairy products. Four identical main course plates had to be completed within the two-hour time period or marks were deducted from the final score. Main course plates had to represent an a la carte sized portion with the inclusion of 120 grams of protein, one starch garnish, two vegetable garnishes and one sauce. 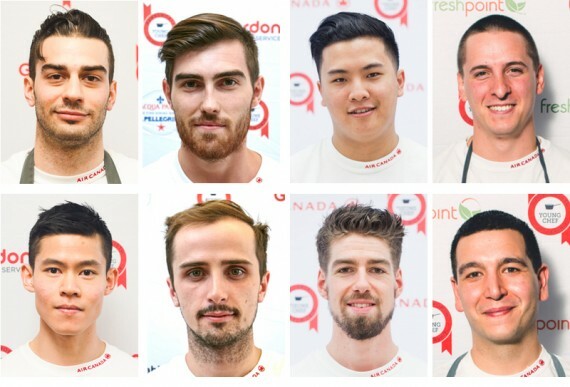 We kicked off the competition in Calgary at the SAIT kitchen, naming Alex Edmonson as the heat winner. Recently starting his own personal chef service, Edmonson showed the esteemed panel of judges that he was ready to ready to vie for national title by executing his stuffed rabbit saddle with in-depth skill and finesse. Securing second was Coleman Everest from MARKET with his ‘Schnitzel & Spatzle’. Heading back to our hometown, Vancouver, the second heat of the competition was held at Vancouver Community College. Alex Hon from West Restaurant impressed the judges with his trio of rabbit and following in close second was Corey Hess from Royal Dinette with his assiette of rabbit. 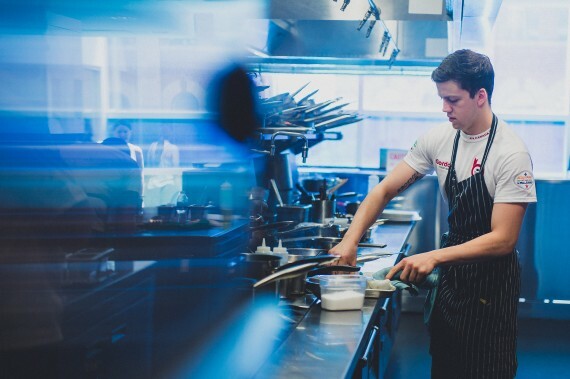 We continued our search for top young culinary talent in Montreal. Being only the second year the competition has been extended to this city, the talent pool was strong. Producing the ever difficult, rabbit en croute, Massimo Piedimonte from Le Mousso solidified his place as the heat winner when the dish came out perfectly. Ritchie Nguyen from Maison Publique also cemented his position in the national finals with his dish, Rabbit Ballantine. Our last destination to round up the final 8, was Toronto. Returning contestant, Stephen Baidacoff whom works as a private chef, continued to amaze the panel of judges with his elevated focus and determination. He won the heat with his roasted rabbit and cappellacci with leek. Not far behind, securing the last position in the finals with crusted rabbit loin and rabbit tart was Alex Nacinovich from Restaurant Bosk. 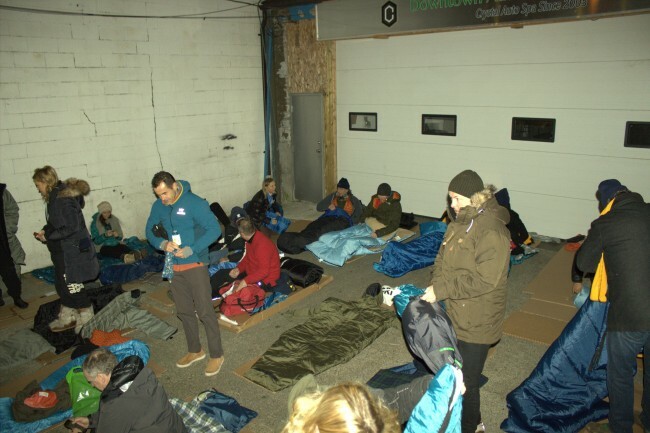 You may or may not know that I slept on the street last month to raise funds for Covenant House Vancouver on Drake and Seymour. We met at 7:30pm and listened to moving stories from people who use the House and we found out how they ended up there. I was given a letter upon entering and was asked to be the first speaker. It was from someone that came to the House and the letter told their story. I had to give it back to them: despite my hardened exterior I knew that if I started reading this I wouldn’t be able to get through it without choking up. 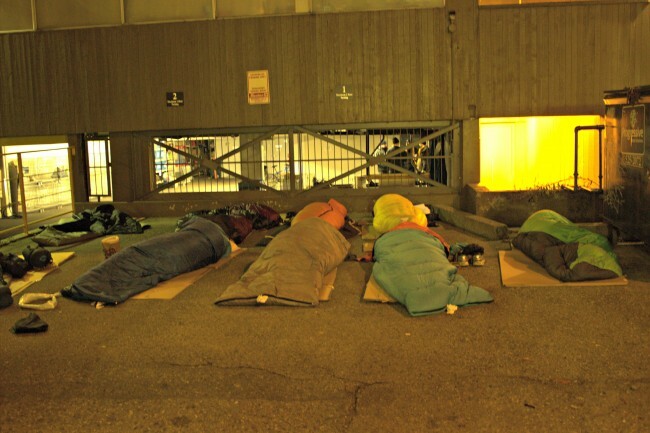 We got changed at 10pm and I had two giant cups of warm tea – things that you’re not going to have the option of doing if you are homeless. I put my cardboard down at 10.30pm and had a good long look around the alleyway. ‘Piece of cake’, I thought, ‘I’ll be asleep in no time with all these clothes I have on. Fjallraven on West Broadway had heard what I was doing and gave me a jacket, toque and gloves – that was super kind of them and I literally don’t think I could have done it without all of these clothes. It was at least -1C and I heard rumours of it being -3C. I was wearing long johns, two pairs of socks, two shirts, fleece and boots etc but I didn’t sleep a wink last night: not one second. My head was itchy from the toque that I had on and I could feel my face freezing as I lay down in the alley, looking up at the stars. I’d put earplugs in, which I thought were my secret weapon, but they didn’t block out the sirens, trucks, horns and people shifting around. What stressed me out most were my feet – they were very cold and at noon today they still feel cold. I just wanted it to end but it was only 2:10am as the wind blew over the cardboard that I was using as a wind block and the brutal sub-zero air whipped across my face. I thought about the kids that end up on the street: they probably come from a home with a lot of issues and they have not been equipped to handle day-to-day life. They probably have never been loved like you or I and have made some choices in life that haven’t worked out. We see them all the time in Vancouver but it’s almost like they don’t exist: we walk around them or look the other way. I, like most people, have thought ‘just get a job!’. Some of the kids at the House need to deal with mental health issues, addictions or need a break from step-fathers or mothers who themselves have all kinds of problems. Some have been in foster care all of their life: thankfully there are foster givers in the world but I couldn’t imagine what it would be like to grow up like that. I only spent one night on the street and came to the conclusion that in this weather I would lose my mind within 48 hrs and make some REALLY bad choices to survive. 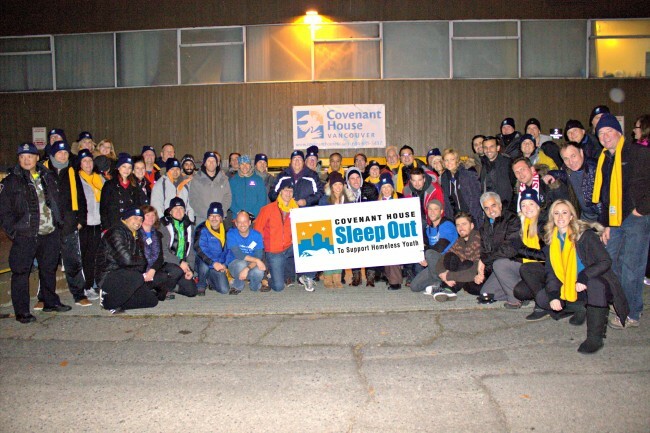 The people that take the youth in at Covenant House do amazing work. There are 126 people that work there: please find a way to help them out. Finally I would like to sincerely thank everyone that donated to sponsor me and would like to thank Fjallraven for the warm clothes and Covenant House for inviting me to do this. Christmas is almost here and there is no better way to ring in the most joyful time of year than with lovingly made treats from Pastry Chef, Wayne Kozinko. 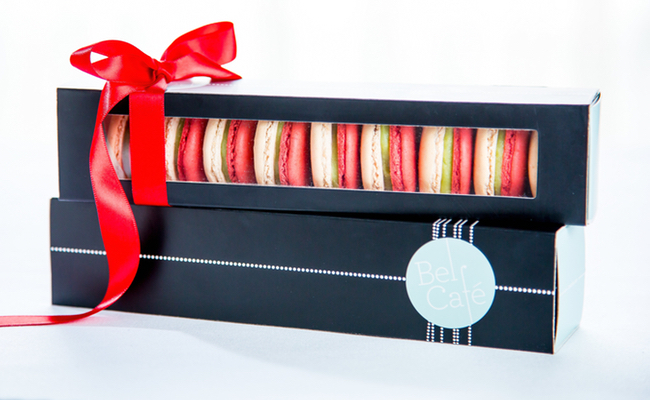 Bel Café offers classic Christmas delights such as vanilla shortbread ($14 for box of 12), eggnog lattes ($5.50) and peppermint macarons ($2 each). Indulge in more traditional holiday pastries such as Christmas cake ($17), linzer cookies ($14 box of eight) and milk chocolate, chestnut and caramel entremets ($6.20 small / $40.00 large). Catch the eye and satisfy the sweet tooth of holiday party guests with one of Bel’s edible and decorative macaron trees. These 20-piece trees add a unique twist to ordinary Christmas décor and are priced at $55. Say cheers to the season at Bel with house-mulled cider ($4), bourbon-spiked cider ($9) and eggnog with spiced rum ($9). Get into the holiday spirit with Bel Café’s seasonal menu favourites and delicious Christmas treat offerings. . For large corporate orders, contact events@hawksworthrestaurant.com. Prices include tax. 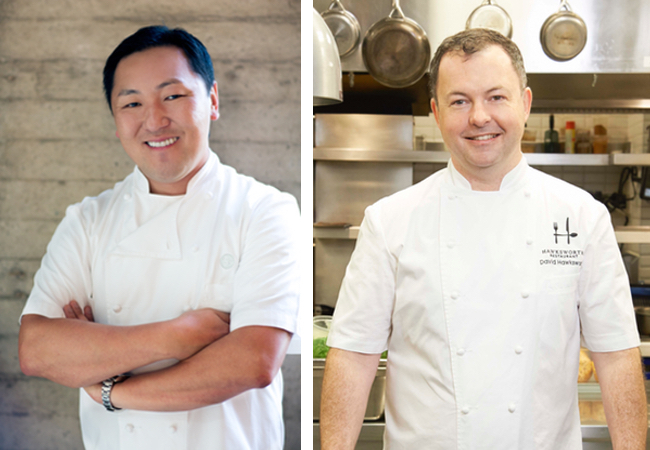 Hawksworth Restaurant in the Rosewood Hotel Georgia has partnered with Tourism Vancouver to bring Los Angeles’ Chef Yoon of fine-dining Lukshon for a restaurant takeover as part of Dine Out Vancouver. The five-course feast take place within Hawksworth Restaurant’s Pearl and Art Rooms on January 21 and marries both chefs’ love of local ingredients and fresh, creative South East Asian flavours with a wonderfully West Coast twist. Asian influenced dishes appear alongside SoCal ingredients such as Santa Barbara Sea Urchin, for a taste of contemporary Canadian meets Californian cuisine.